A frittata is an egg dish, similar to an omelet, but ... different. 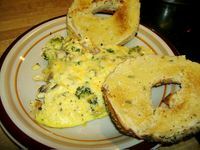 With an omelet, you traditionally cook the eggs, "lay in" the center ingredients, and then fold the eggs over them. With a frittata, you mix all the ingredients right into the eggs, mish-mosh, and then just let it cook up flat, without folding. A minor difference, but I have this little bit of trivia in my head and I have to flaunt it. Heh. A frittata is perfect for a small intimate brunch with friends. It doesn't have to be served immediately, and in fact, a frittata is sometimes served at room temperature. Personally, I prefer hot out of the pan, but when you're busy prepping and cooking for company, it's good to have a dish that can be set on "hold" for a while. This dish is also highly customizable - just add whatever ingredients you love best. Melt butter in a large skillet. You will need a large, deep non-stick skillet with a lid. Add broccoli and onions and allow to cook for about 5 minutes, adding the mushrooms and ham after about 3 minutes. In a bowl, combine eggs, water and milk, and a sprinkling of salt and pepper if desired. Beat or whisk lightly. Stir in 1-1/2 cups of the cheese and then add it all to the pan. Sprinkle with salt and pepper. Cover and cook over medium heat 10-15 minutes until the eggs are set. A few minutes before it's ready, sprinkle the remaining 1/2 cup of cheese over the top. Allow the cheese to melt and the eggs to finish setting up, and then remove from heat. Serve in a large pie dish or plate, cut into wedges. You can cook a frittata in the oven if you prefer. You can use an oven-proof skillet or a flat casserole dish. Bake at 375° for about 20-25 minutes. The bottom and sides will be a nice brown shade by the time the center of the eggs have set up. If you have the heat too high, the bottom will burn, so slide a spatula gently under the sides to check partway through cooking. Turn the heat down a little if the bottom is cooking too fast. I personally like it a little soft-ish, but I've seen frittatas served where the eggs are so set you can almost pick a wedge up like a slice of pie. This is absolutely the best site I have seen for tea, coffee, recipes. What a lifesaver you have been for me. Yeah, me too, weekend brunches are the best. And you're right, this is a great way to use leftovers. You can put almost anything in an egg dish like this! frittata is a great way to use some of the week's leftovers. I like to make one on sundays for our brunch.